The Art of... Creating a Snack Board — on a Budget | The Art Of | Kids VT - small people, big ideas! I have a somewhat embarrassing — though surprisingly common — affinity for looking at beautiful photographs of yummy things to eat. That means I follow a lot of food bloggers on Instagram. It was on one of those accounts — Weelicious — where I first saw a photo of a snack board. For those who aren't familiar with the term, picture a cheese plate you might order at a fancy restaurant (another one of my affinities). Then, take away a considerable amount of the cheese and add baguette slices, crackers, berries, fruits, veggies, charcuterie, olives, dips and all other sorts of appealing finger foods. Presentation matters, and not just because it determines the number of likes you'll get on Instagram. As any parent who's called broccoli a tree or made happy-face pancakes knows, the way you display food is half the battle when it comes to feeding kids. No one's going to clamor over a skimpy, beige snack board. Think bounty — a rich palette of varying colors, sizes and textures artfully arranged and practically spilling off the board. The enticing smorgasbords I've scrolled through on social media look expensive. So I wondered: Is it possible to create a deluxe snack board on a budget? I turned to Mae Quilty, outreach and education manager at Burlington's City Market, Onion River Co-op, for help. I met Quilty at City Market's South End store, and we grabbed a cart. Our mission: to create a snack board my family of four could eat for dinner for around 20 bucks. First, we hit the store's grab-and-go section, where I picked up Hunan dumplings, roasted root veggies, hummus and hard-boiled eggs. These items cost between 79 cents and $3.19. We cruised into the bakery section, where Quilty advised me that the best price for a baguette was Klinger's long loaf for $2.99. Then we hit up the deli, where I scooped up a hunk of cob-smoked pepperoni for $2.67 and a block of Cabot Farmhouse Reserve Cheddar, on sale for $2.29. Since it was Thursday, bulk items were 10 percent off. I picked up small bags of dried cranberries (44 cents), raw almonds (90 cents), sunflower seeds (31 cents) and chocolate-covered sunflower seeds in hues of lavender, dark purple and bright yellow ($1.36) to serve as a pop of color and a sweet treat. In the produce department, we grabbed locally grown carrots and an apple, a few tangerines, sugar snap peas, and a Chioggia beet, which reveals a candy-cane pattern when sliced open. None of the fruits or veggies cost more than two bucks. Before heading for the register, I threw in a $1.79 package of sesame-flavored dried seaweed for a bit of saltiness and crunch. My haul totaled $28.39, a bit more than I planned to spend. But after Quilty and I assembled the board, I had enough baguette, cheese and sausage left over to make lunch for two the next day. The assembled board looked professional, fun to eat and most definitely Instagrammable (though I refrained from posting it). An added bonus? I took it home to my family for a no-muss, no-fuss dinner. I got four likes at the kitchen table that night. 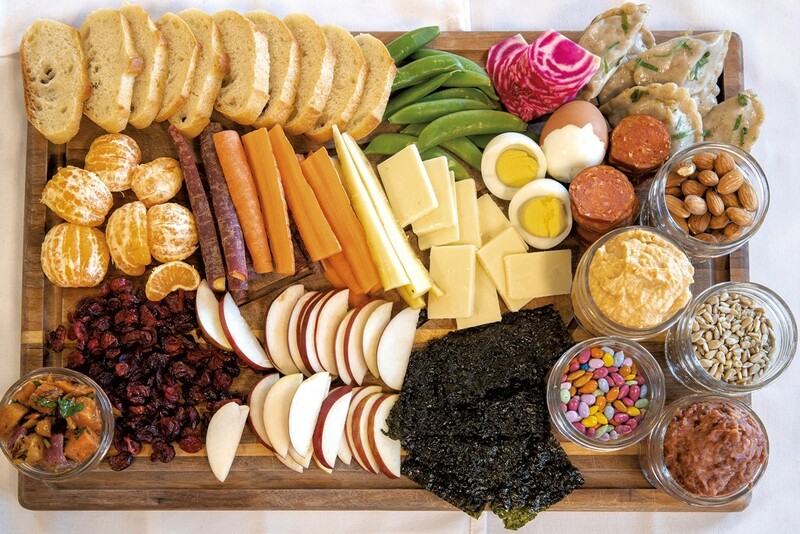 Want to make a snack board at home? 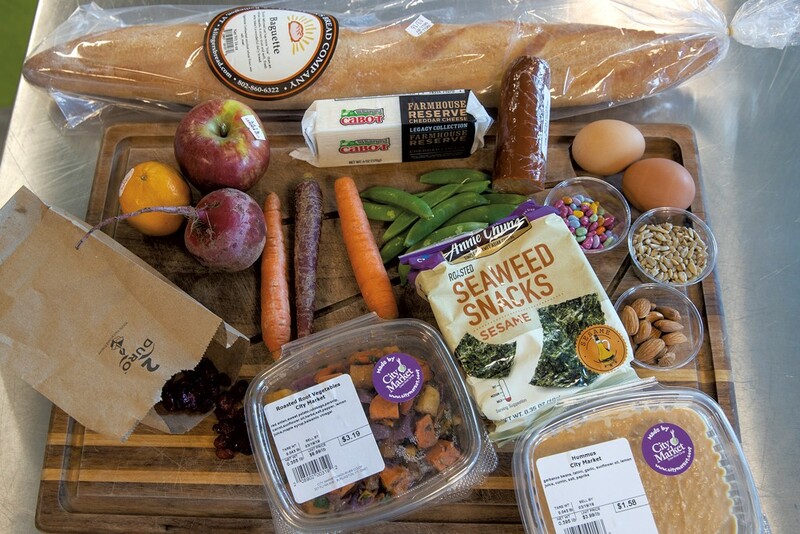 Follow these tips from City Market's Mae Quilty so your smorgasbord doesn't break the bank. It's cheaper to make your own hummus, bean dip and kale chips. Find City Market's recipes for roasted garlic white bean hummus, kale chips and chipotle black bean dip below. Shop the bulk section for small amounts of more expensive items, such as nuts and dried fruit. Bring your own containers to reduce waste. Look for prepackaged cheese and meat trim — irregular and end pieces — in the deli department; they cost less than the cleaner-cut varieties. Some grocery stores offer a reduced-price produce bin with perfectly good-to-eat fruits and veggies that may be bruised, past their peak in ripeness or unappealing at first glance. Think vegetarian. Choose protein-rich hard-boiled eggs or oven-roasted chickpeas in place of more costly meats. Since organic produce usually comes with a higher price tag, use the Environmental Working Group's Dirty Dozen list — 12 fruits and veggies you should buy organic whenever possible — and Clean Fifteen list — 15 items that are OK to buy conventional — to guide your purchases. Take the whole head of garlic, and slice off the top, so a little bit of each clove is exposed. Place in aluminum foil and drizzle 1 teaspoon of olive oil on top of the cloves. Wrap the head of garlic in the foil and place in the oven. Roast for 30 to 40 minutes until the cloves are slightly brown, noticeable juicy and fragrant. Remove the head from the foil and let cool for 10 to 15 minutes. While the garlic is cooling, in the bowl of a food processor, add white beans, tahini, lemon juice, cumin, smoked paprika, salt, pepper, 1 tablespoon olive oil and 1 tablespoon parsley (reserve the remaining 1 tablespoon for topping). Squeeze roasted garlic, with skin removed, into food processor. Blend until smooth. Taste and add more salt, pepper or parsley. Spoon into a serving bowl and top with a drizzle of olive oil, remaining parsley and black pepper. Rinse and dry the kale, then remove the tough center ribs. Place in a medium mixing bowl and tear into pieces. Add olive oil and sprinkle with coarse sea salt. Mix oil and salt into kale leaves with your fingers until well-coated. Arrange leaves in a single layer on a large baking sheet. Bake for about 15 minutes, or until crisp. Place vegetable broth, celery and carrots in a small saucepan and bring to a boil. Simmer with lid on until veggies are tender, about 8 minutes. Place chopped chipotles, black beans, garlic powder, cumin, coriander and cooked vegetables in food processor or blender and pulse, scraping sides occasionally, until well-blended with a thick, chunky consistency. Season with salt and pepper to taste and let cool 20 minutes; this dip is best served at room temperature or chilled.